Exciting times here at Bocannaco! CannaGize is shipping imminently -- woo hoo! weekly call between Doc, David and Mike today and believe me, there's some incredible stuff coming. We are especially looking forward to a great time in Torrance on Saturday at the TRAINING... and in fact Doc is going to do his first Bocannaco product training ever and it is going to be filmed !!! You guys know how exciting that is, and especially for all of you who have never met or heard Doc! Also, I had a great day yesterday with the Doctor that Dr. Lawrence set me up with regarding my Parkinson's.... will tell you all more about it when I have time. I really don't know where I'd be if Dr. Lawrence and his awesome oil hadn't come along. It's almost last day of the month so you know what that means: BIG PAYDAY! From Founder Gary Spickerman: It's been Brutal today. Can't describe it. Tough on the hands and face. I commend all the guys working together to get the lights back on in this deep freeze. 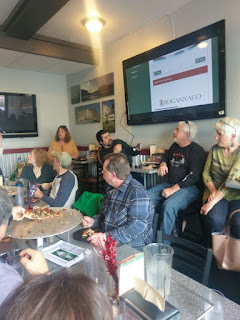 Great pics from the initial San Carlos meeting -- so much going on all over the country! 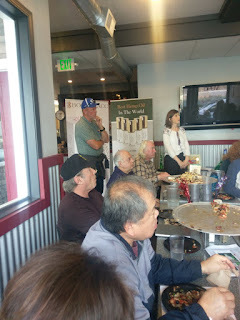 Thanks to Rring and Renee Mohr for hosting this event! 6pm Pacific Time -- 9pm Eastern -- 8pm Central. Hawaii ?? Mike and Barb are off to Newport Beach today so will call in from the road. It's a busy week: lots going on in Bocannaco-Land so be expecting great things! These are for BOCANNACO DISTRIBUTORS only. Keeping your Team in the flow of Bocannaco information is what facilitates growth: SHARE WITH EVERYONE daily! 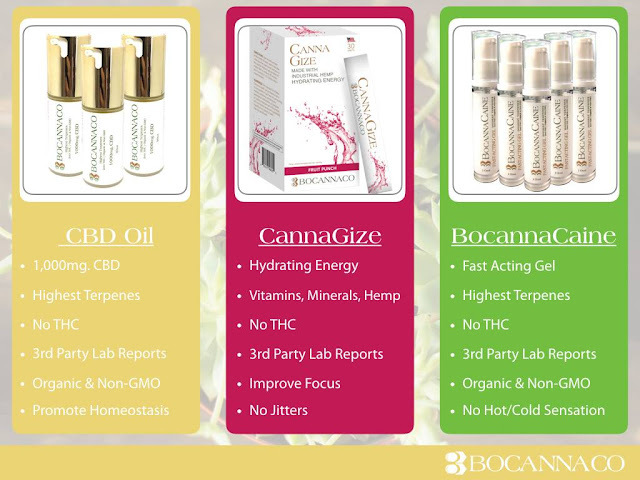 Have you checked Bocannaco's independent Lab Analysis? 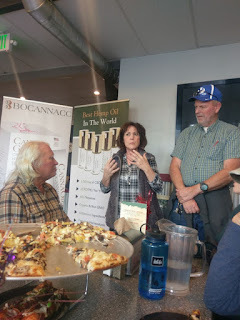 It helps us understand how truly amazing -- and unique -- Bocannaco's oil is. 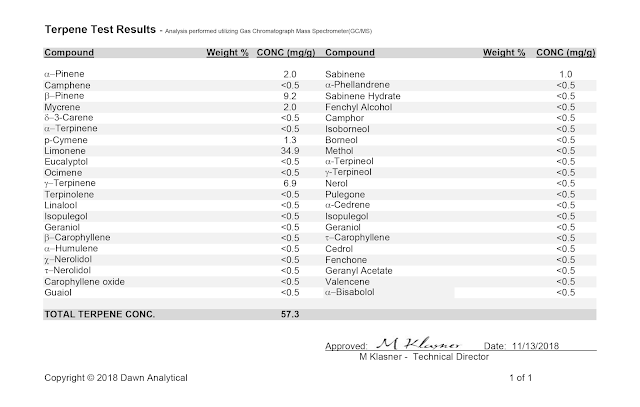 Why does Dr. Lawrence INSIST on cramming Bocannaco with native terpenes? For an answer, let's explore just one -- Limonene. You can see from the analysis below that it is the most abundant one in Bocannaco. So exactly what does it do? Read below. Terpenes are the class of chemicals with a large selection of fragrances and flavours. They contribute significantly to quality of fruits and vegetables, and they are involved in the synthesis of various biochemical substances such as vitamins, hormones, oils, and of course cannabinoids. Terpenes extracted from plants are the most important components of the essential oils used in herbal medicine, nutrition and cosmetics. Cannabis is among the plants with the greatest complexity of terpenes, bringing us all their aromas and therapeutic effects. The combination of different terpenes and cannabinoids is called the entourage effect. Studies on the entourage effect in cannabis have found that limonene activates synergies with several cannabinoids and other terpenes. This terpene interacts positively with cannabinoids and with other terpenes such as caryophyllene and linalool. Furthermore, the increased cell permeability caused by limonene facilitates the assimilation of other substances by the human body. From a twist of lemon in a cup of tea to the “lemon fresh” scent of detergent and furniture polish, just about everyone has encountered the terpene limonene—you just might not have known it. And while limonene can add flavor to foods and a pleasant smell to cleaning products, this common plant oil also has powerful healing properties. Limonene is one of many terpenes found in marijuana, and it works with cannabis compounds such as tetrahydrocannabinol (THC) and cannabidiol (CBD) to create a synergy that boosts the effectiveness of cannabis for treating pain and the symptoms of many health conditions. Research on the benefits of cannabis has focused largely on the effects of its cannabinoids, mainly the well-known THC and CBD. Along with these two components, cannabis contains more than a hundred other “ingredients” whose properties haven’t yet been investigated in depth. That includes terpenes, oils produced by the plant’s resin glands—the same ones that also produce THC and other compounds. Terpenes aren’t unique to cannabis. They’re produced by a number of plants and herbs—and even by some insects. A single plant can contain many different terpenes, but each plant has its own unique terpene profile that’s dominated by one particular terpene. These terpenes can be extracted for a number of purposes, including flavoring and scenting various products, aromatherapy oils, cosmetics and industrial solvents. The term terpenoids is often used to describe these substances—but terpenes and terpenoids aren’t the same thing. Chemically, terpenes are hydrocarbons, meaning the only elements they contain are hydrogen and carbon. But terpenoids are terpene products that have been altered by other processes such as the oxidation that takes place when flowers and leaves have been cured and dried. Terpenoids may also be synthetically created by combining different terpene molecules or adding elements from other sources. Because terpenes and cannabinoids such as THC and CBD come from the same source, they work together, each boosting or modifying the effects of the other in a synergy that’s more powerful than each one alone. Until relatively recently, few studies have explored the role of terpenes in cannabis for medical uses. But those studies reveal that both terpenes and cannabinoids bind to the body’s natural endocannabinoid receptors. And not only do terpenes exert their own influence on those receptors, they can also affect how the receptors respond to THC, CBD and other cannabis compounds. Limonene is one of the most commonly occurring terpenes in a wide variety of plants. As D-limonene, it’s found in especially high quantities in lemons (hence the name), but also in other citrus fruits, juniper and rosemary. Another variation, L-limonene, is found in pinecones and needles and is used in a variety of industrial solvents and cleaners. D-limonene, or just limonene, is also found in numerous cannabis strains, mostly sativa. These can be especially effective for boosting energy and reducing stress, along with the many other health benefits of cannabis in general. Studies have revealed that CBD, the most prevalent non-psychoactive compound in cannabis, acts on the body’s CB1 receptors to affect a long list of processes. That’s why CBD can improve nerve and muscle function in disorders like Parkinson’s disease, reduce inflammation and fight infection, as well as potentially suppress factors that can lead to cancer. Limonene has also been called the “anti-... terpene” because preliminary studies have shown that it may even be able to reduce or eliminate certain kinds of ... tumors. Along with the other terpenes in each strain’s unique profile, limonene works with all other parts of the whole plant to support the body’s own healing mechanisms. This is a tincture bottle. It is what most CBD oils come in. Notice the suction tube that goes in and out of the open bottle each and every time it is used. This is an air-tight vacuum sealed bottle of Bocannaco oil. It is more expensive than ordinary tincture bottles, but Dr. Lawrence insists on it for several reasons. The primary reason is because the oil is pristine when it gets to our customers and it remains pristine all the way to the last pump! Nothing airborne or other-borne can get in to contaminate or deteriorate the oil and you are assured of the purity and effectiveness of Bocannaco's oil with each and every pump! Who do you know who suffers? What's So Special about Hemp? Marijuana plants cannot be hidden among hemp plants. The former grows wide and less tall (5-10 feet), whereas the latter is grown more densely and taller (10-15 feet), to produce maximum stalk fiber lengths. 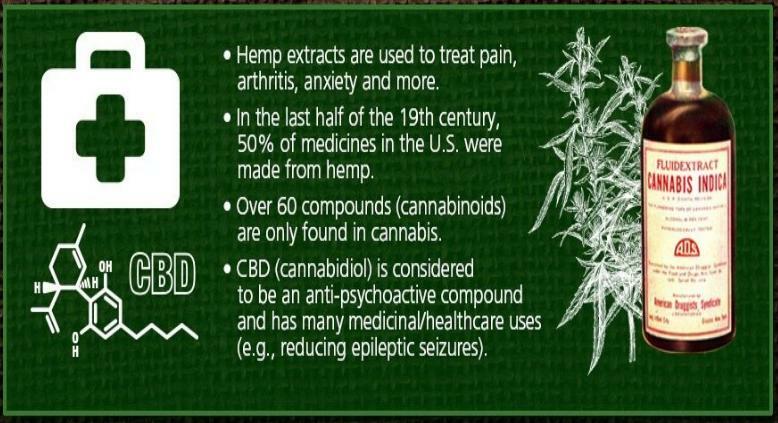 Next time you're wondering what's so special about Hemp Oil, get serious about hemp and learn what's so special about this legendary plant! Then it's easy to figure out why EVERYONE should add Bocannaco Oil to their daily supplement regimen! The sports & energy drinks market is growing at a CAGR of 11.3% during the forecast period of 2017 to 2025. The sports & energy drinks market is going to have a rocket boom for their sales, import, export and revenue in the forecast period of 2018-2025. This statistic shows energy drink sales in the United States from 2015 to 2017. According to the report, U.S. sales of energy drinks amounted to approximately 2.98 billion U.S. dollars for the 13 weeks ended on December 23, 2017. Can we say a little bit about Bocannaco's long-awaited and much-heralded entry into the energy drink market? Is there a market for it? Check the info above! Are there chemicals in it? Nope; just the good stuff from plants. We are excited to share with everyone in the San Carlos area the truth on THC FREE CBD products! Dispel the confusion! Seating is limited! RSVP early to reserve your spot! 760-382-5849. With Dr.& Mrs. Robert Lawrence, Bonnie Keller, Mike & Barb Lammons and more amazing Bocannaco Leaders! 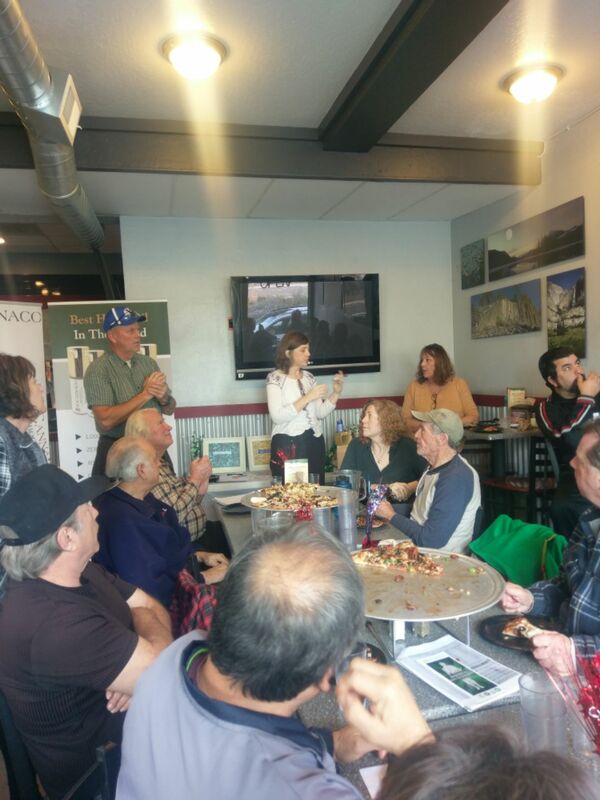 We invite you to come for an amazing morning of Distributor Training that has been designed to give you foundational training for a successful Bocannaco business. 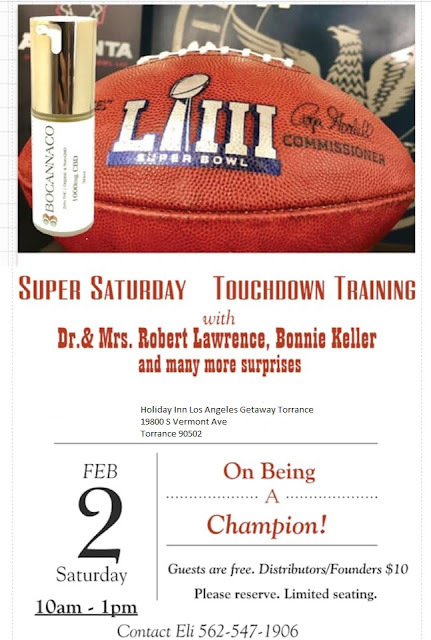 We are meeting at Bocannaco Torrance Office, February 2, 2018 (Saturday), Please see attached flyer. Reserve your seats - SEATING IS LIMITED: Founders/Distributors are $10 (including Materials) and Guests are Free. Come even earlier and have breakfast and Coffee will be served. We've now made it available to SHARE the marketing videos directly from the back office to your social media pages. Just head to the Videos section, click the arrow in the upper right hand corner of the video and share directly to Facebook, Tumblr, and Twitter! How awesome is that?! Another great addition for those of you hosting meetings and presentations, we've also put together a document with a link for every marketing video so that you can download the videos directly to your device! No more worrying about your internet connections! Look for the VideoLinks PDF in the Documents section! Thanks so much, Anthony a.k.a. The Voice of Bocannaco! The timing with Bocannaco -- being in the first year of business and growth -- is massively on the side of its distributors! Although the companies above are stable and enormously successful, as are the 90+ more network marketed companies generating billions of dollars on the Top 100 list -- the fact is, Timing alone would work against a new distributor starting with one of them today. Why? Because their products aren't good? No. Because their huge growth is all behind them. Unique and unduplicatable product line and source. Remember: A rising tide lifts all boats! Even if you're not a massive tanker, your boat can't avoid rising higher if you put it in the water today! And SHARE THOSE VIDEOS! PUMP IN PUBLIC! Help somebody today!